Some time ago my team and I came in to accelerate a software company that had been started by a group of developers. The Board of Directors of the company, who had brought us in to straighten things out and get their software to market, were quite upset with the company’s development team. “We’ve invested over $4 million so far. They’ve created a product with 100 features. When do we sell it ?”. I quickly pointed out that what they were asking is the equivalent of asking a duck not to quack, or a dog not to bark. The lesson here is that we each have a role – and that smart managers work and manage individual strengths, not weaknesses. Developers , well, develop. Attorney’s manage risk. Accounts count. And marketers market. It may sound simple, but knowing and recognizing each team’s role in product development is critical. It is then up to each individual to think outside their own role, and recognize how their actions effect others within the organization. 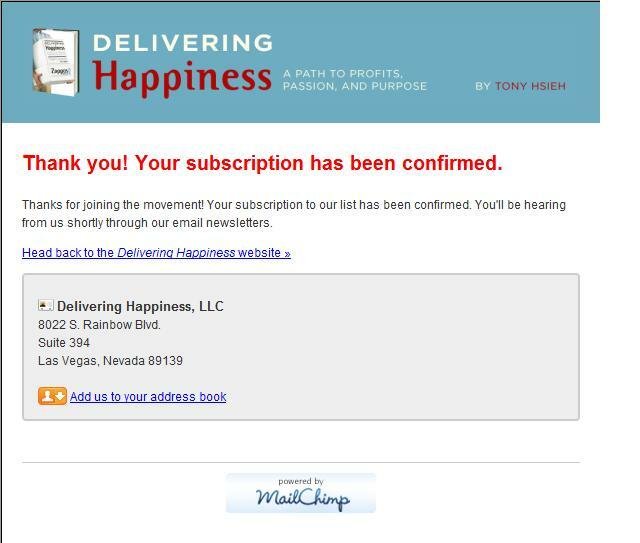 Recently I was invited to read and review an advanced copy of “Delivering Happiness”, a new book by Tony Hsieh, the founder and CEO of Zappos.com. Zappos put the offer out to bloggers and influencers as part of an intelligent online marketing campaign for the book. As a part of the “early reader” program, I’ve made a commitment to writing an honest review in early June when the book is released to the public. While I have to admit that part of the reason that I signed up for the program, and made the commitment to write the review, was to be one of the few (supposedly 500 in total) that get a sneak peak of Delivering Happiness, for the most part it was to get a free book that outlined the story behind the Zappos – a company whose business model (and more importantly culture) I admire greatly. Encouraging early adopters to “beta test” your product or service is a great way to create buzz. Zappos has taken this an extra step by including an extra book – to be given away to one of my lucky followers. So here’s your chance to read Delivering Happiness, first. Comment on this post, and in 150 words or less write what delivering happiness in the corporate setting means to you. If your answer is the best, you’ll get the book. You can only enter in once, and we will choose the winner. All decisions are final – no whining. Oh, and because it’s a big world, you’ll need to pay for shipping. Look for my official review for June. Ever since its release last year there has been quite a bit of talk about the strategy behind Microsoft’s search engine Bing. “Does the Redmond giant really think that they can compete with Google?” is what some pundits are asking. Other pundits have (wisely, in my opinion) noted that Microsoft doesn’t need to dominate search. It is a $100 Billion (yes, with a B) industry. Every percentage point is $1 Billion (again, with a B). If Microsoft moves from their current search dominance of %15 to %20 is an extra $5 Billion to the top line. Also, with Bing Microsoft has decided to focus on some of the highest paying search terms. Apparently they don’t want to dominate all search terms, just the premium ones. Hence their tight integration with specific services, such as travel. While first to market, disruptive marketing practices, and market dominance are all tenants of successful marketing (technology or otherwise), there is something to be said for playing second fiddle in a huge market – especially if you can maintain lower operating costs. Back in June 2009 Wired Magazine had a great article about how the American auto company needs to retool it’s thinking. Rather than owning the entire vertical, Wired suggests that effective auto companies own the production lines and the distribution channels. Accessories and add-ons would be serviced by third parties, who would design based upon the auto companies specs. My fellow developers will appreciate this as a classic API model, which in layman terms is the practice of opening “hooks” into your software and allowing third party developers to create value added features and benefits. Apple has used this model with the iPhone, and iPad. Microsoft has been using this model for years. This model has numerous benefits. It gives you the ability to expand quickly and deliver more value to the customer without using internal resources. Also, there is a tangential effect that gives the core product a “platform” status as more companies integrate with the base functionality. Look to Facebook as a perfect example of this. Essentially each application maker is another advocate building the overall user base. And don’t let your bean counters get their nickers in a bunch … there are many ways to monetize this, including an annual licensing fee for the developer, percentage of sale on goods sold, or both. Whether you’re talking about online or offline purchases, receipts are a great way to continue the conversation with your customers, and encourage repeat orders and up-sales. If you’re anything like me, you’ll casually look at a receipt several times after a purchase, and even keep them for years. Unfortunately, they are one of the most under utilized forms of marketing. Supermarkets have been using receipts to market complimentary products for years. They use complicated software to deliver targeted ads based upon current and previous purchases. Fortunately, you do not need this software to effectively market using receipts. Here is a great list of ways that you can improve your marketing on receipts. One of the ten commandments of email marketing is to always encourage your recipients to add your email address to their contact list / address book. Many email clients (like Microsoft Outlook) will automatically white list emails coming from one of the contacts in the address book: to put it another way, your email will not be categorized as spam if they add your email address to their contacts list. Now getting the recipient to do this is a challenge in and of itself. The goal is to make the process so simple that they can’t help but do it. As you can see at the bottom, they’ve offered me an easy way to add their email to my contacts list – using a VCard. A VCard is a file that is recognized by most email clients. Now truth be told, I think that they could have made the call to action more compelling with better graphics and messaging … but a good “college try” none the less. And a great use of technology !